Our Guru's recommendations for the best places to stay in Melbourne are littered through the chic and shiny Southbank, flashy and sandy St. Kilda, in the lush, green, foodie South Yarra, on chic Chapel St. and in the heart of town. Melbourne is perfectly summed up by its most famous annual event: The Melbourne Cup - a day of hedonistic appreciation for the finer things, blended with an easy, classy charm. Its reputation for quality and finish, as well as its weather, culture and atmosphere are more stylishly European than you'll find elsewhere in Australia. But don't expect stuffy suits and silver service, Melbourne is more about cool cats, foodie haunts and people with a nose for their coffee. Most of the city's museums are located right in the city centre, so if you’re here for the museums or the theatres then the Southbank or the CBD - Central Business District, which is also the centre of town - are probably the best places to stay. If you’re love art, coffee or you’er a hipster then Fitzroy is for you. Carlton is also great for cool coffee lovers, close to Lygon street and Melbourne’s old Italian district. If you’re looking for upmarket style South Yarra is for you. If you're here on a budget then a number of the city's hostels are located just east of Docklands. It might not be obvious to every visitor, but Melbourne is right on the beach, and has a very nice beach, thank you very much, which you can stay right beside if you stay in St. Kilda. Footscray is great if you’re looking for something different, it’s Melbourne’s great colourful melting pot and residents are passionate about the ‘Scray. Close to the wine region of the Yarra Valley, Melbourne takes its wine and food seriously. The centre of town has recently sprouted a collection of new rooftop bars and the "Laneways" are full of alleyway eateries, converted from once industrial buildings. But as well as wine and food, Melbourne also takes coffee, The Arts, and shopping seriously. Shopping fans should try Collins Street for the smattering of Parisian boutiques and Chapel St. for quirky chic. However, you shouldn't miss out on the Queen Victoria markets either - the largest open-air market in the southern hemisphere. Melbourne's cultural calendar is packed with festivals celebrating some, or all, of the above. In fact, people from Melbourne consider the city to be Australia's Cultural Capital. Locals from other centres don't really agree, but most would begrudgingly admit that Melbourne is 'pretty arty', with its tens of galleries and museums, hundreds of live music venues and a myriad of colourful street artists. Melbourne is also keen on its sport, and it's not just the gee-gees and the Tennis Open that people flock to. The MCG is a cricket Mecca and there's a Formula One race track nearby, as well of course as the footy - both the AFL and the Rugby. Don't forget there's a myriad of great beaches too - Melbourne is situated on the horseshoe shaped Port Phillip Bay. So take time to check out Brighton with its colourful beach huts or further out-of-town Altona is a popular beach for swimmers (it's got a no boat zone), and sailors alike (there are yachting facilities close by). Be sure to wander down Hosier Lane, just a short distance from Federation Square. This colourful spot is filled with vibrant grafitti that truly expresses the city's fun and unique artsy ambiance. The Shrine of Remembrance, Melbourne's most iconic landmark, honours the sacrifices made by Australian servicemen and women. Set amongst 13 hectares of parkland, enjoy wonderful views from the balcony of the Shrine. A moving and incredibly informative spot. Take a trip out to Port Campbell National Park, famous for its sculpted rock formations. Head off on a walk along the picturesque Twelve Apostles coastline and walk through the tunnel under the Great Ocean Road to reach an area with breathtaking views. Sports fans will love a visit to the MCG (Melbourne Cricket Ground), Australia's largest, oldest and most renowned sporting venue. This 95,000 capacity stadium is stunning when packed to the rafters, so head along and watch the cricket or take in an AFL game. What's more, it houses a fascinating museum that's an absolute must visit. Our pick of the best places to stay in Melbourne has something for all tastes and budgets, whether you want sheer luxury (book The Como) or your prefer things a bit more low key (The Prince is a great option). 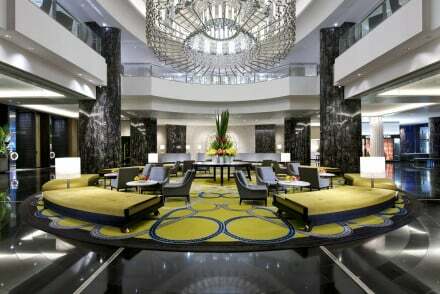 The Langham Hotel Melbourne is a luxury hotel with an unrivalled position right on the Southbank by the Yarra River. As well as offering amazing city views and easy access to many of Melbourne's highlights, The Langham has some impressive decor and a fantastic spa. Ovolo Laneways is right in the heart of the central business district, close to some of Melbourne's best bars, cafés, restaurants and a short walk from Federation Square. This hundred room hotel is also great value, with rooms starting at £128 per night including breakfast. Crown Towers occupies the other end of the Southbank, closer to the Dockland. You're still perfectly located and the views, from generous sized rooms and the rooftop gardens, are incredible. 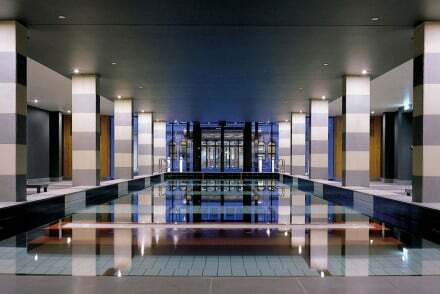 The Park Hyatt is a Melbourne classic, offering five star luxury, right by St. Patrick's Cathedral and the Victoria Markets. The Larwill Studio is an art centric spot, boasting rooms combining soft hues with vibrant modern artworks on the walls. This contemporary stay also provides yoga mats in the rooms and offers tours of the city for the discerning visitor. Bikes available to hire. The Olsen is a modern hotel in a great spot, especially for local dining. There are 200+ comfortable rooms and great facilities, including a glass-bottomed swimming pool, spa and gym. The Lyall Hotel & Spa is right by the Botanical Gardens in South Yarra, and focusses on giving you a happy healthy stay via its luxurious spa and relaxed atmosphere. Each room has its own kitchen and balcony whilst you're also able to hire their bikes for free. 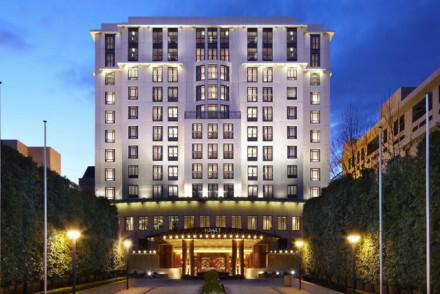 The Como, on Chapel St., is a luxurious hotel close to galleries, restaurants and Chapel St.'s shopping! Its family friendly suites include access to the gym, pool and BBQ area, and you're close to the beach too. The Prince, in hip and happening seaside St. Kilda, is a very reasonably priced 40 room hotel, that features tasteful decor and great facilities, including a steam room and sauna. Robinsons in the City is a charming six bedroom B&B, perfect for those wanting to see the city without breaking the bank. With unpretentious accommodation right around the corner from all the sights (starting at just £84 per night), and hearty breakfasts served up, it's a super spot. 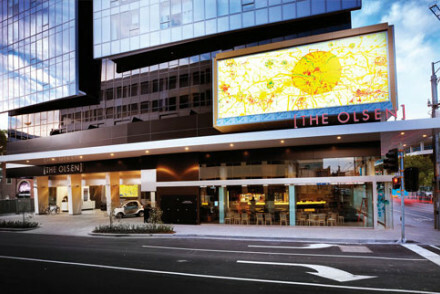 The Olsen in South Yarra is a modern hotel in a great spot, especially for local dining. There are 200+ comfortable rooms and great facilities, including a glass-bottomed swimming pool, spa and gym. Quirky, colourful The Cullen is just opposite Prahran Market and Chapel St., a great value place for lone travellers or those with families - there are family suites with their own kitchenettes plus they offer a free pram hire and babysitting service. They'll also rent you a bike. And the walls are covered in art by Adam Cullen. 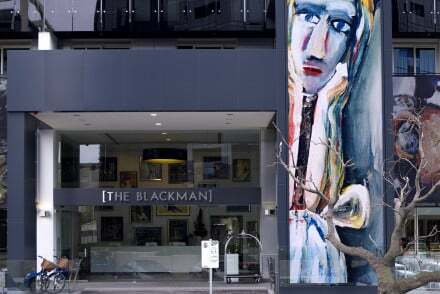 The Blackman is another hotel with contemporary art adorning its walls and family sized suites with kitchenettes. 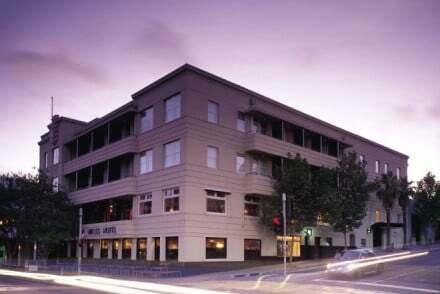 This 200 room hotel on St. Kilda Road is also well positioned, and has great facilities. 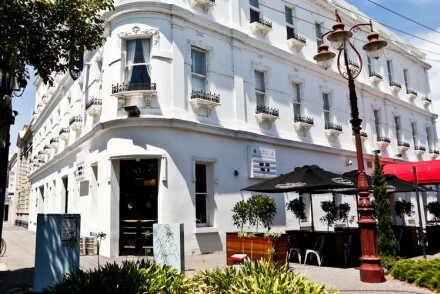 Middle Park Hotel is set in a period building in the heart of the city. Featuring stylish rooms decorated in a loft style and starting from just £87 per night, this is a top spot for seeing the city on a budget. If you think a self-catering option would best suit your needs then check out the wide variety available with our partner, booking.com. Melbourne is a popular year-round destination, but if you want the best weather come during the Spring (September-November) or Autumn (March-May). This way you avioid the busy summer crowds and the excessive heat. The winter months should be avoided (June to August) when the climate can be wet and cold! International visitors should fly into Melbourne Airport, 22km north-west of the city centre. From the airport, it's probably easiest to take the 24/7 SkyBus shuttle service that runs from the Coach Terminal at Southern Cross Station (in the centre of town). You can hop onto it either outside the Virgin or the Qantas/Jetstar domestic terminal. Purchase tickets at the T1 and T3 desks, or electronically with the driver. This costs $18 one way, $30 for a return, takes around 20 minutes and leaves every 10 minutes. If you fancy a cheaper alternative then take the public transport route. Buy a Myki Card at the SkyBus terminal then take the 901 bus to Frankston and get off at Broadmeadows Station. From here, switch to a train into the centre of town. In total, this costs $7 on the weekdays and $3.50 over the weekends. Hopping in a cab is undoubtedly the easiest way to get to and from the airport, however it'll cost you between $55-65. Browse through our list of all the best places to stay in Melbourne. Alternatively you can widen the net and check out all our recommendations in Victoria. A hard to beat location in the seaside suburb of St Kilda, offering the best of city living by the sea. This clean hotel boasts tasteful decor and great amenities, including a sauna and steam room to unwind in after a hard day at the beach. 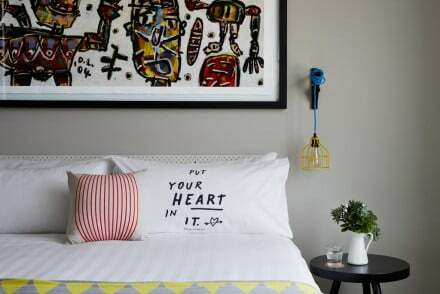 Located opposite the bustling Prahran Market and Chapel St, this quirky looking hotel doesn't disappoint with lashings of artwork by Adam Cullen. Large suites come with a fully equipped kitchenette. Babysitting services, free pram hire and family suites available. 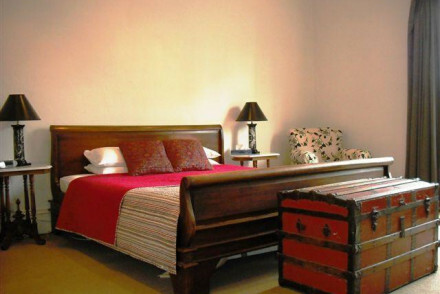 This charming, six bedroom B&B offers friendly and personal service in a fantastic location. Homely, unpretentious bedrooms and rustic red brick walls - perfect for those looking for a restful and sociable environment to explore this great city. Hearty breakfasts and lots of local knowledge. With funky contemporary art adorning the walls, this boutique hotel on St Kilda road has fantastic amenities, including luxurious suites with fully equipped kitchen facilities. The perfect pairing of practicality, comfort and style. 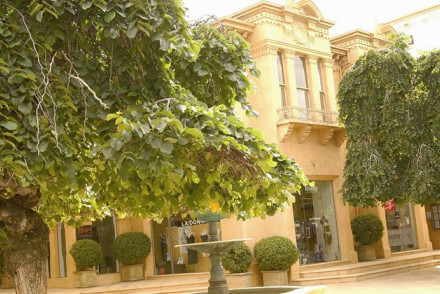 A period building opposite the Albert Park Australian Grand Prix - a must for racing fans! Guests can enjoy meals in the Brasserie restaurant with a side of Ozzie charm. Rooms are decorated in a fuss free 'loft' style in greys and accent reds. Dramatic, dark tiled bathrooms feature roll top baths. Local markets - The largest open air market in the southern hemisphere The Queen Victoria Market houses an impressive array of goods. Great walks - Home to a variety of exotic flora and fauna take a wander through Melbourne's expansive Botanical Gardens. An art centric hotel boasting an excellent central location. Contemporary rooms are clean in design with soft hues and plenty of glass offset by vibrant modern artworks. A health thread runs through the property with designated snacks, meditation and yoga mats offered in room. Modern living defined. Value chic - Giving chic Scandi-style right next to Royal Park all at a very reasonable rate. Great walks - Take a stroll around the nearby Royal Park and make a pit stop at Melbourne Zoo. Escape to the country with a stay in this luxurious hotel and spa surrounded by ten acres of extensive parkland only thirty minutes from Melbourne's CBD. Tasteful decor matches the stunning 1870s Italianate Werribee Mansion setting. This luxury hotel offers unrivalled views of the city from its location on the Yarra river. The decor inside is impressive, with a marble staircase, waterfall features and chandeliers dripping from the roof. The perfect place to mix business and pleasure. 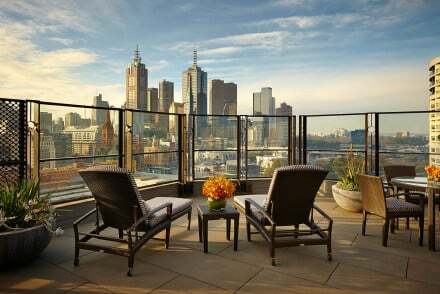 This grand five star hotel offers contemporary luxury in the heart of Melbourne. Spacious rooms complete with Italian marble bathrooms and views to the historic St Patrick's Cathedral ensure a lavish stay. 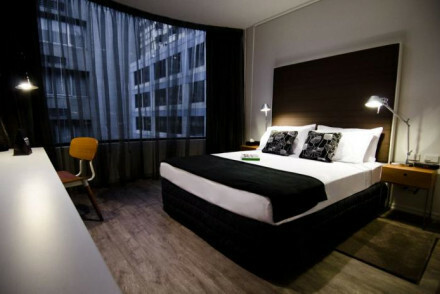 Sleek and smart contemporary hotel situated on the banks of the Yarra. Fantastic facilities, including luxurious large rooms and two tennis courts on the rooftop garden, combine glamour and wellbeing. 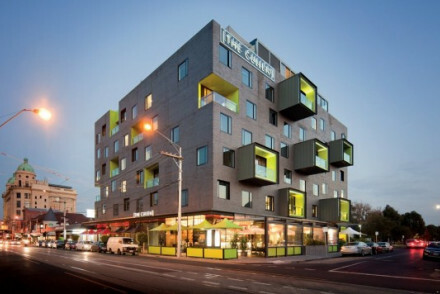 Contemporary hotel with a central location in South Yarra offering good amenities and comfortable rooms. Boasts a glass-bottom swimming pool, spa and gym, and all within easy reach of nearby restaurants. Tucked away on one of Melbourne's famous laneways, this hotel is situated in the heart of the bustling CBD close to the city's best bars, cafes and restaurants. Complimentary breakfast is also included. Each room in this stunning hotel comes with a fully equipped kitchen and balcony. Contemporary oriental design with opulent fabrics. Centrally located near the Botanic Gardens, there is also the offer of free bicycle hire to get around the cycle-friendly city. Make use of the luxurious spa too. 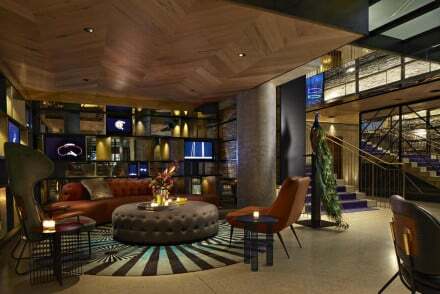 A fashionable industrial-chic style downtown hotel with a buzzing rooftop bar, with in-house gourmet restaurant. Featuring great views of the city and centrally located within easy distance of sights such as the Regent's Theatre, St Paul's Cathedral and Federation Square. Luxury hotel at the heart of Melbourne's bustling Chapel St. Near to all the attractions, art galleries, restaurants and boutiques. Family friendly suites available, with top-notch facilities including a gym, swimming pool and BBQ area.